Juicy, tender, flavourful, succulent – these are just some of the superlatives used to describe the Poulet de Bresse, the most delicious chicken in France. Produced only from white chickens raised within the legally defined province of Bresse (only 5% are exported), a visit to Bresse is one of the few ways to savour this gourmet meat that’s regarded as the Rolls Royce of chicken. Once used as currency, two dozen birds were presented to Marquis of Treffort in 1591 as recognition for defending the citizens of Bourg from an army. Today, its fans include French presidents Francois Hollande and Emmanuel Macron, and a large number of Michelin-starred chefs – Heston Blumenthal himself regaled it as a dish in his book, In Search of Perfection. These specially-bred chooks are distinguished not only by their appellation d’origine contrôllé (AOC) status, secured since 1957, but the appearance of their white feathers, blue legs and red combs. Their colouring practically makes these chickens the emblem of the French Republic flag. Raised under strict conditions, its élevage (breeding) is key to its unique flavour and firm, juicy meat. Fed with a mixture of corn, wheat and milk (all of which have been grown in the same region), the feed is deliberately low in protein to encourage the animals to forage for insects and worms. By law, the chickens are to roam free as soon as they’re five weeks old and farms have to dedicate a minimum of 10sqm per animal. At night, they’re kept in épinettes (wooden cages) in low-lit rooms so the animal can relax. Pre-slaughter, they’re kept in these same epinettes and are fed a fattening diet of milk and maize for 30 days. The capon (male rooster) is grown to eight months, or when it reaches a minimum of three kilograms. Females are slaughtered as young as four months old. Once slaughtered, a technique called roulage is applied whereby a white linen cloth is wrapped around the animal and stitched to keep the air out. This method is thought to preserve the meat and distribute the fat evenly. 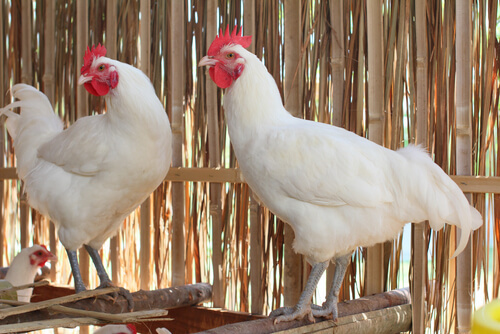 When sold in shops, Bresse chickens are marked by a metal leg ring on its left foot bearing the name of its producer. Prices can be as high as €40 (AU$63) per kilogram. If you’re visiting Bresse in December, the Glorieuses de Bresse, dating back to 1862, is a series of events – gourmet tastings, demonstrations, contests and cooking lessons – organised in four towns (Bourg-en-Bresse, Louhans, Pont-de-Vaux and Montrevel-en-Bresse) to celebrate the gourmet bird and its farmers. It’s an experience that’ll elevate your appreciation for the most expensive chicken in the world.